Pete's MONTGOMERY CANAL Photo-site. (Section 1a). Restoration Photo’s. Frankton Jcn. To Lockgate Bridge (Section 1a ). Frankton staircase locks (2) and top pound before restoration work commenced. The same area as the above photo. Taken during the restoration work. 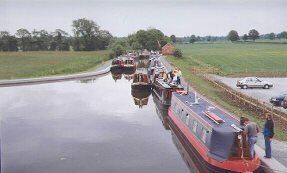 The staircase lock chambers stand out prominently in the centre of the picture. 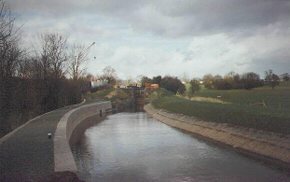 Taken from the staircase lock. In the centre of the canal bed you can see the top of the drain plug . A chain is attached to this plug to enable a complete draining of the pound if ever required. 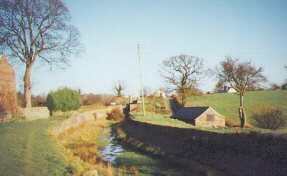 The old boat builders cottage seen on the right of the photo has the remains of the dry dock in its garden. 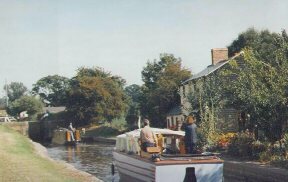 The entrance to the dock is to be seen to the right of the narrowboat that is approaching the bottom of the lock. 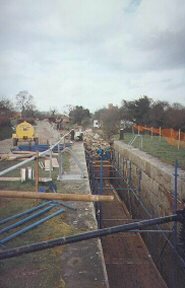 This view was taken from Frankton Bottom Lock during restoration work. 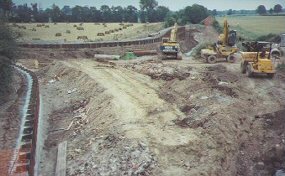 The new base was constructed from granite quarry waste laid on a membrane to give stability in the peaty soil. A new concrete bed was then constructed. Take looking back towards Frankton Bottom Lock across the area seen in the previous photo. 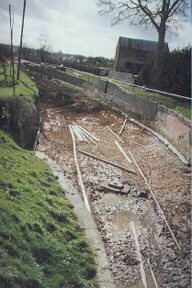 This shows the new canal bed before the water level had been restored to normal. The type of construction is plainly seen. 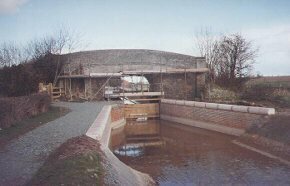 Frankton Bottom Lock chamber seen during restoration work. Below Frankton. Taken from Lock Gate Bridge. 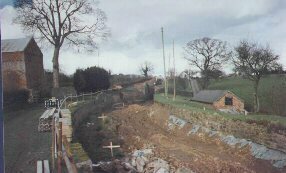 This was the scene during restoration of the junction with the Weston Arm. The old stable is just visible. Past the stable, a new nature reserve has now been constructed. The same scene taken after restoration. Lock Gate Bridge seen during restoration. 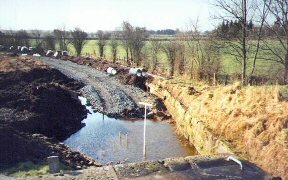 This is also a good example of the new below-water construction seen before water level were restored.